Take a botanical garden tour. Activities include world-class sportfishing, river tours, a botanical garden tour, horseback riding, kayaking, swimming, water-skiing in the gulf or river, hiking on the Osa Peninsula, or just plain relaxin' in a hammock with the sounds of the Pacific Ocean nearby. 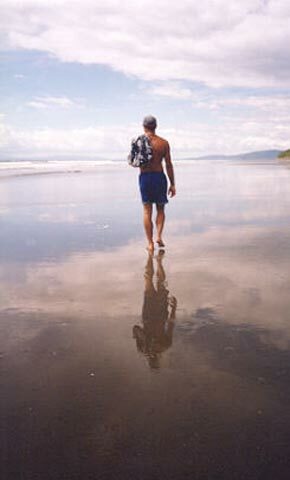 Straight across the Golfo Dulce one can see the Osa Peninsula, home to the spectacular Corcovado National Park. Transportation to the Osa Peninsula can be arranged from Zancudo. See the links above for more information to help you enjoy your stay at Playa Zancudo. The Cabinas Sol Y Mar, (which includes the Sol Y Mar Restaurant and Bar) is a great place to stay, and the friendly owners are great hosts. Use the links above to see what services are available, and learn a little more about the people, the area, and the local details. For more information on the many activities in our area, see the details below. 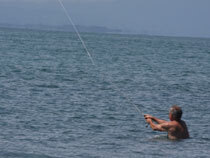 For more information on Sportfishing, see the link above. All of the following activities are available year-round! 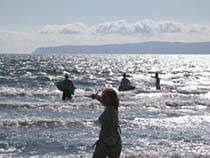 This can be done entirely by powerboat or you can combine a partly-guided powerboat tour with the return trip paddling in kayaks. This is a guided tour by the owners through their beautiful and interesting gardens. 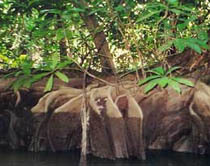 This is a professionally-guided hike through the trails of the Osa Peninsula. National Geographic describes the Osa as "the most biologically intense place on earth." This tour leaves in the early morning and includes boat taxi to and from Puerto Jimenez, truck and tour guide to Matapalo (the tip of the Osa Peninsula) and snacks. 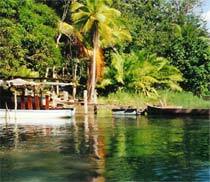 This sanctuary is only accessible by boat and is located on a remote beach, with jungle behind it. The tour offers the rare opportunity to see many exotic and unusual animals up close, including very tame monkeys that love to play and be held. There are also other tropical animals including birds, sloths, anteaters, and ocelots – depending on what animals they are taking care of at the time. Some animals are permanent residents and others are to be released back into the wild. A kayak ride is a wonderful way to really connect with the nature of Zancudo. You can glide silently among the birds and wildlife and get a close up view of the many wonders in the area. Take your kayak into the waterways behind Zancudo to take in the beautiful surroundings and explore the exotic flora and fauna amongst the roots of the mangroves. Paddle your kayak out into the ocean for a refreshing ride among the abundant sea life of the Golfo Dulce and enjoy the opportunity to gaze at the open, uncrowded views of the pristine beaches along the peninsula. The ocean is very safe for swimming right in front of the Sol y Mar. The southern half of the beach has bigger waves. In contrast, the northern section of the beach is nearly flat. The Sol y Mar, being halfway, provides good swimming, body-surfing, or boogie-boarding. Surfboard rentals are available in Zancudo. Good surf-able waves are found within a 10 minute walk of the Sol y Mar. Your local guide is good, even though we fondly refer to him as "Bad, Bad, Raul." You'll ride along the beach and/or in the countryside nearby. Look for local animals and take in the views of farmland and the gulf. Beach Cruisers can be rented at the Sol y Mar. You can explore our sleepy little town at the perfect pace. Pavones - surf mecca, is world-famous for its long left-breaking wave. San Vito - coffee and agricultural area in the nearby hills. 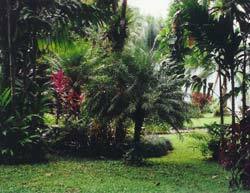 A visit to Wilson Botanical Gardens is often included in trips to this area. San Jose - for those wanting to see more of the country, a car or van and driver can be arranged for your trip to or from San Jose. We host a lively horseshoe tournament on Sunday afternoons and Wednesday evenings during high season. This event is attended by Ticos (local Costa Ricans), local ex-pats, and tourists... it's a great way to meet some of the locals and practice your Spanish. 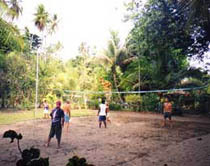 A sand-pit volleyball court is right beside the bar. Most Thursday evenings, a local resident, Peter, will be strumming his guitar to all-time favorites. Bring your instrument and join in the fun. Sports-starved fans can catch a game (football, baseball, hockey, basketball and soccer) on DirecTV in the bar. We have a large book exchange on-site. The local ex-pats will ADORE you if you leave something new and interesting for our library. A quaint beachfront thatched structure is located conveniently on the Sol y Mar property. Imagine a relaxing massage with the sounds of the ocean just steps away. No instruction is necessary on the art of relaxin' in a hammock and/or staring at the beautiful sunsets over the Golfo Dulce.